It was so much fun debuting our new album (in performance) at CG! Of course, we hoped the album could have been finished by the show. But we are making sure that we do our due diligence on all of the post production stuff for the album so it rocks! We anticipate a mid-May release! The album art for So Much To Say is finished! We can't wait!! New Album In The Making!! We are breaking ground on our first full length album in less than two weeks and we couldn’t be more excited! So much work has already gone into this project and we just can’t wait to share it with you all! This is our story! We always want to be transparent with our audience and invite you all into the journey. We love the listening-room-environment! What a cool opportunity to be a part of Cultivate’s Sound Sessions Series and share so much of our new music with a fantastic audience! It was a unique experience last October interacting with other university musicians as we shared our music and some of our insights regarding PR, Booking, and Songwriting. We greatly enjoyed playing at the Waco Downtown Farmer's Market last Saturday. Look for us there again on September 8th! The Silo District Marathon is the annual race hosted by Magnolia here in Waco, Texas. The profits from the race, which was a total of $250,000, went toward cancer research. Medicine Man was happy to be a part of this wonderful event by playing along the route to amp up racers during the race. Medicine Man is excited to work with the Baylor Campus Kitchen Project on April 14th at their Garden to Table fundraiser! 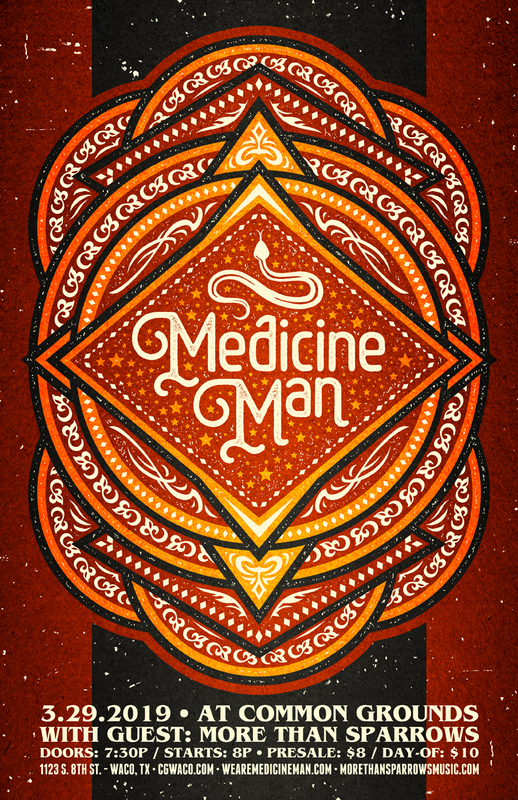 Medicine Man is playing at the event from 7-8p. For more details, visit the organization's website. New tune coming your way just in time for summer. Available Monday on our website and SoundCloud. We look forward to playing at Dichotomy in Waco, this Friday (April 7th) at 8PM! We are so pleased to be playing at Kissing Tree Vineyards in Eddy, Texas on March 31! Come enjoy award winning wine, artisan cheese, Texas art, five star service, enchanting ambiance and, of course, some groovy jams! Attention all Austin peeps! We're gonna be in the neighborhood again on March 10th! Come catch us at Cherrywood Coffeehouse at 7:30! We're opening for The Collection at Common Grounds on Saturday, February 25th! Come out, grab some joe, and enjoy some sweet jams!